According to ifoAppleStore, about 90 percent of Apple's 2,372 retail workers spread across 21 outlets voted in favor of the new contract (PDF download), which was certified on Friday by Australia's Fair Work Commission. The contract becomes effective on Nov. 1. With the 2014 to 2017 agreement, workers are split into three levels and further broken down by full-time and "casual" categories. Level 1 employees —specialists and Geniuses —will receive $20.95 per hour (about $22.44 AUD), while Level 2 starts at $25.26 ($27.06 AUD). Casual employees get about 25 percent more per hour in lieu of health benefits. The highest Level 3 is reserved for managers who will make an annual salary of $72,799 ($77,997.25 AUD). As noted by the publication, Apple's starting pay level is 25 percent higher than Australia's minimum wage and includes a statutory two-percent annual increase on continued employment. The contract covers overtime pay, working hours, meal allowances and other specifics. Of note, a section on grievances points out that employees are entitled to "redundancy" pay when a position is no longer needed. Under the stipulation, workers can be paid up to 20 weeks' worth of wages when terminated. Additional perks include a $29.56 bonus very two weeks for employees with first aid certification, "Community Service Leave" and a provision that gives time off for donating blood up to four times a year. 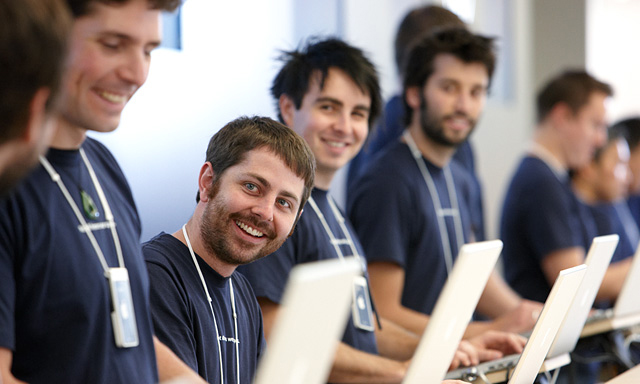 ifoAppleStore points out that Apple's contract also makes mention of bag checks. In 2013, former Apple employees in the U.S. sued the company in a class action lawsuit over lost wages associated with said bag checks. Under the Australian contract, Apple is allowed to "conduct random bag and or locker inspections at any time" and requires employees "to participate and fully co-operate and present your bag/locker or personal effects for inspection."